You know those recipes that you remember from childhood? The ones that you associate with food and family and comfort? Is it just me, or are those the things we vegans find ourselves craving most often? Fortunately, in my experience, they’ve also turned out to be some of the easiest to veganize. Take my mom’s standard oatmeal muffins, for example. I think the recipe originally came from a Betty Crocker book, most likely the giant orange binder from the ’70s that everyone seems to have in their kitchen. Mom would whip them up to go with dinner sometimes, adding chocolate chips so that they were more like a dessert than a side dish. I devoured them as a kid, happily licking chocolate off the paper muffin tin liner and going back for more. Recently I had a hankering for those muffins again, not as an accompaniment to dinner, but for breakfast. 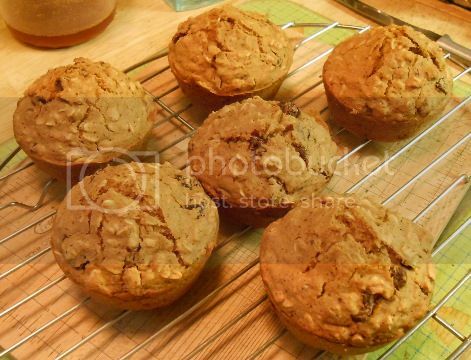 Big, warm muffins with chewy oats and just a hint of sweetness…oh yeah. I needed to make those babies vegan. Healthier, too, seeing as it turns out the original recipe called for half a cup of sugar and a third cup of oil. But muffins are one of those baked goods that you can make healthy substitutions in without much change to the finished product. In fact, I always wind up enjoying healthy muffins more than regular ones! This reworked recipe uses a bit of maple syrup for the sweetener and some applesauce instead of oil. I also added raisins and walnuts, but if you’re in the mood for a dessert-type muffin, you can omit them and add half a cup of vegan chocolate chips instead. It’s all about the nostalgia! Make 12 standard muffins to snack on or 6 big ones for a warming breakfast treat. Peheat the oven to 400F. Grease or line a standard 12-cup muffin tin with paper liners, or use a 6-cup tin for big breakfast muffins! In a measuring cup, combine the nondairy milk and vinegar. Set aside. In a medium mixing bowl, whisk the flaxseed and water together until thickened. Add the nondairy milk mixture, the maple syrup and the applesauce and stir to combine. Add the oats, flour, baking powder and baking soda and mix until just combined. The batter will be lumpy. Fold in the nuts and raisins. 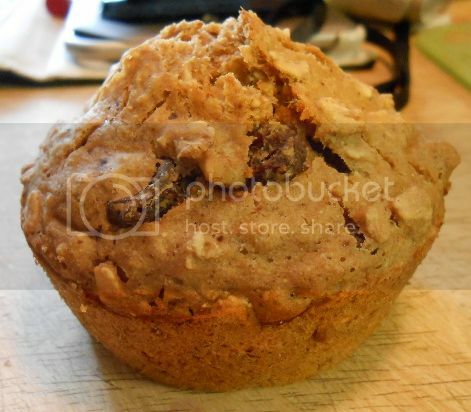 Divide batter among muffin cups until each is about ⅔ full. Bake for 20 minutes, or until a toothpick inserted in the center comes out clean. These muffins are fantabulous! I didn’t have high hopes, based on some earlier baking failures of which we will not speak. (My failures, of course.) These babies, however, rock. They are now a breakfast staple for me! Thanks loads for posting this recipe!